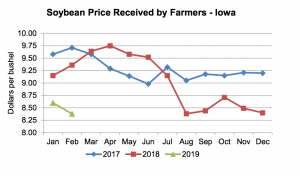 A recent news article reported that Chinese imports of U.S. soybeans increased in February, contributing to a narrowing of the trade deficit between the two countries. Nonetheless, the imports were significantly lower than last February. Meanwhile, U.S. Trade Representative Robert Lighthizer and U.S. Treasury Secretary Steven Mnuchin continued trade negotiations with China in Beijing last week. Chinese Vice Premier Liu He travels to Washington, D.C. this week, as the talks continue. 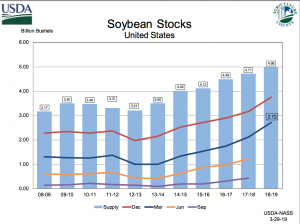 Last week, Reuters writers Hallie Gu and Dominique Patton reported that, “China’s imports of soybeans from the United States in February surged from January as the cargoes booked following a truce in the trade war between the two countries arrived, according to customs data published on [March 25th]. China brought in 907,754 tonnes of U.S. soybeans in February, up from 135,814 tonnes in January, the General Administration of Customs said. “Most recently, Chinese buyers booked about 1.7 million tonnes following U.S.-China trade talks in Washington, during which U.S. officials said Beijing vowed to buy an additional 10 million tonnes of the oilseed,” the Reuters article said. Today from @uscensusbureau: Monthly U.S. International #Trade in Goods and Services, January 2019, https://goo.gl/jTHo7w #Foods, feeds, and beverages increased $1.3 billion.#Soybeans increased $0.9 billion. Thursday’s deals bring China’s total purchases of the latest U.S. soybean crop to around 12.7 million tonnes, compared with more tan 28.5 million tonnes sold at the same point last year, to according to U.S. Department of Agriculture data. 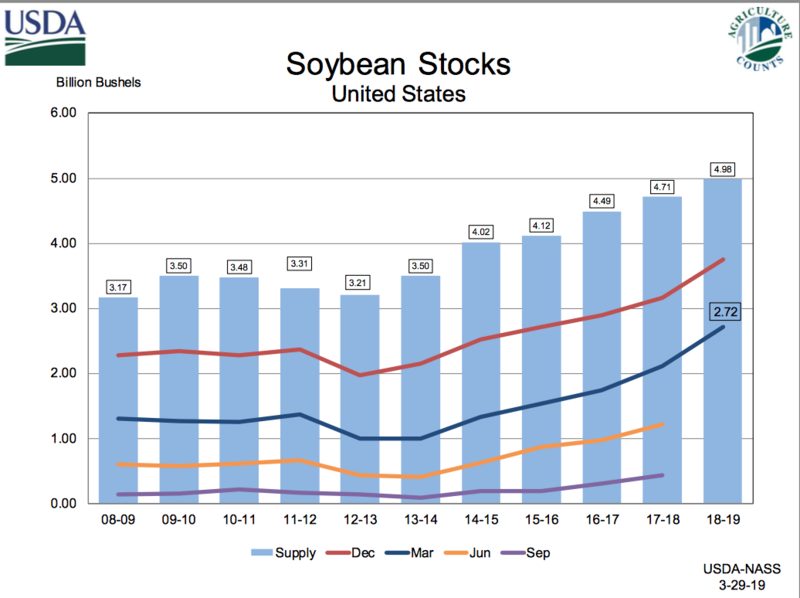 “Prospective Plantings, Grain Stocks, Rice Stocks- Executive Summary,” Lance Honig, Chief Crops Branch. USDA- National Agricultural Statistics Service (March 29, 2019). Late last week, Bloomberg’s Sarah McGregor and Kevin Cirilli reported that, “The Trump administration is prepared to keep negotiating with China for weeks or even months to reach a trade deal that will ensure the world’s second-largest economy improves market access and intellectual-property policies for U.S. companies, a senior American official said. The Bloomberg article indicated that, “U.S. Trade Representative Robert Lighthizer and Treasury Secretary Steven Mnuchin met with Chinese negotiators in Beijing for a working dinner on Thursday. Mnuchin called the meeting ‘very productive‘ before heading out for a full day of talks on Friday. Wall Street Journal writer Lingling Wei reported Thursday that, “The two sides are aiming for a package deal that includes substantial increases in U.S. exports to China and Chinese pledges to address some long-running structural issues, such as allowing greater market access to American companies and boosting protection of intellectual property. Important issues still to resolve include how to enforce a deal and the pace at which the U.S. and China will roll back the tariffs on hundreds of billions of dollars in goods imposed in the past year. “The February 2019 average price received by farmers for soybeans [in Iowa], at $8.38 per bushel, was down 22 cents from the January price and 98 cents below the February 2018 price.” (Iowa Ag News – Monthly Prices. USDA- National Agricultural Statistics Service, Upper Midwest Regional Field Office (March 28, 2019)). On Friday, Bloomberg writers Jeff Black and Jenny Leonard reported that, “Chinese and U.S. negotiators made ‘new progress‘ in trade negotiations as both sides discussed the wording of an agreement that’s designed to resolve a bilateral trade dispute, according to Beijing’s official news agency Xinhua.“The report echoed officials familiar with the talks who said negotiators have been working line-by-line through the text of an agreement that can be put before President Donald Trump and his Chinese counterpart Xi Jinping. A wider range of fentanyl derivatives will be declared controlled substances on May 1, as Beijing moves ahead to meet a promise made to President Trump amid trade negotiations.